The museum has display of wax figures look so alive and filled with expressions. The figures there look so real. Craftsmen created scenes and figures of famous Buddhist monks, past Kings, slavery in Thailand (few hundred years ago), arts and culture of Thailand, etc. There are 2 floors in the museum. It’s really an amazing place and an eye opener. 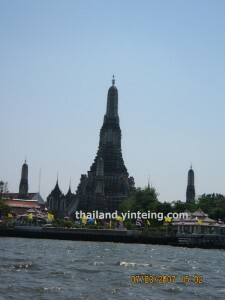 Admission fees: Foreigner: 200baht, Thai citizen: 50baht per person. The Thai Human Imagery Museum was born from an inspiration of a team of Thai artists headed by Master Artist Duangkew Phithyakornsilp who has devoted his time and effort in experimenting the so-called “wax figures” for 10 years and succeeded in creating a new set of fibre glass sculptures with more durability, better craftsmanship and superior realism. The team then cooperated with Master Artist Duangkew Phithyakornsilp in establishing the Thai Human Imagery Museum. Born in 1982, the Museum has as its aims and objectives to promote, preserve and propagate the Thai arts and culture. 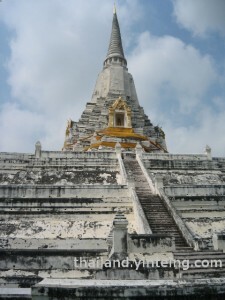 It is also meant to be a centre for displaying the capability of Thai artists in general. On June 14, 1989, the Museum was opened by His Holiness the Supreme Patriarch of Thailand, Somdech Phra Yanasangvara. In the current Chakri dynasty, the current King Bhummibol of Thailand is the 9th King. 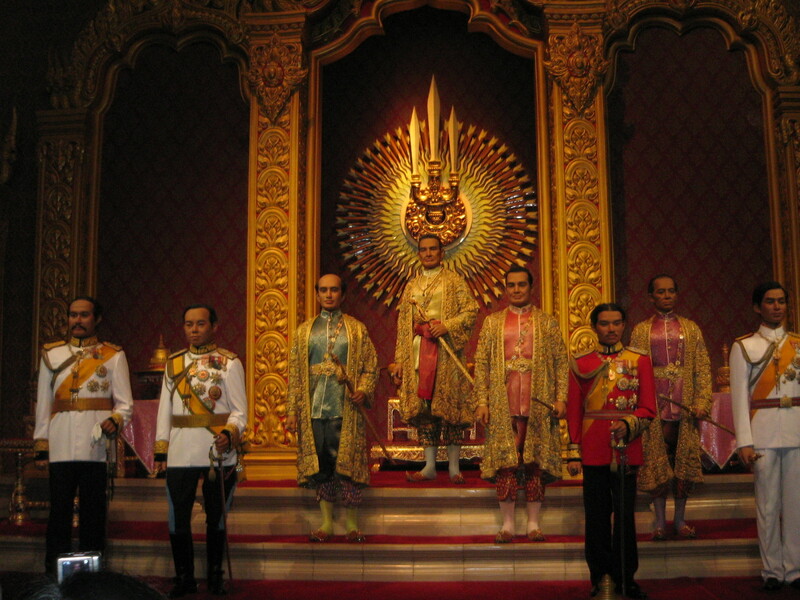 The past 8 Kings are displayed side by side in the museum. You can see the style of dressing from older to more modern from the first to the eighth King (click on the picture to enlarge it). 2nd King: King Buddha Loetla Nabhalai (Rama II) พระบาทสมเด็จพระพุทธเลิศหล้านภาลัย (1767-1824), Ruled from 1809-1824. 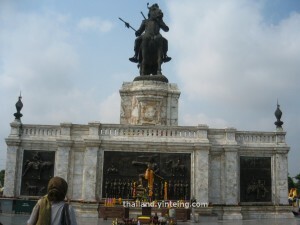 3rd King: King Nangklao (Rama III) พระบาทสมเด็จพระนั่งเกล้าเจ้าอยู่หัว (1788-1851). Ruled from 1824- 1851. 5th King: King Chulalongkorn the Great (Rama V) พระบาทสมเด็จพระจุลจอมเกล้าเจ้าอยู่หัว “พระปิยมหาราช” (1853-1910). Ruled from 1868-1910. 7th King: King Prajadhipok (Rama VII) พระบาทสมเด็จพระปกเกล้าเจ้าอยู่หัว (1893-1941). Ruled from 1925-1935. 8th King: King Ananda Mahidol (Rama VIII) พระบาทสมเด็จพระเจ้าอยู่หัวอานันทมหิดล (1925-1946). Ruled from 1935-1946. Prior to King Rama V, the life of peasants in Thailand were very hard. Many were slaves with hard life and literally nothing to their names. The statues in the museum were so well made that you can see their facial expression and see their plight and suffering. The picture on the left shows a slave, being beaten by the master- the poor man’s back were laden with scars and his face was full of anguish. The suffering of the son broke his mother’s heart, who uses a wet cloth to wipe the blood of his back. Meanwhile, his wife felt so sad (downcast face) and the child crying, even at his young age, understood the suffering that his parents seemed to go through. As I am typing this, I could feel goose pimples, the same felt by my friend when she told me the story behind this picture. See the child in white top and pink pants? 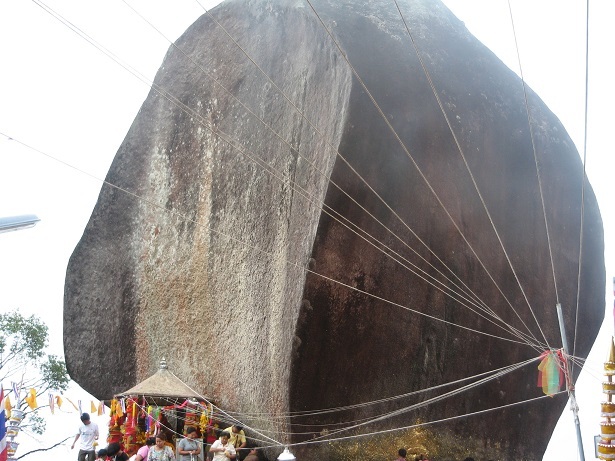 His family could not afford to pay the debts owned to the employees or to a wager. As the result, the child, a girl was to be given away to settle debts owned by the family. Behind the child, was the father, who had no choice but to surrender the child. Behind the man, was the child’s mother, whose downcast face showed anguish of a mother, who is about to be parted with her beloved flesh and blood. The men who were sitting down, were greedily eyeing at the child. If you are at the museum, you will see the kind of looks on the men’s faces were scary and you would not even dare to contemplate the unfortunate fate that was about to befall the child. When King Rama V took over the throne, he abolished slavery in Thailand. He gave away lands to the peasants- allowing them to plant and grow crops. The slaves were told that they need not be bound anymore and were allowed to go home. However, King Rama V also did it tactfully to avoid offending the middle and upper classes. The picture on your left shows a family, being happy as they are finally allowed to go home to land that they can call their own. That is why when you go to Thailand, you can see a lot of framed photos of King Rama V in shops and houses. The Thai people have deep respect for King Rama.